I have MOVED! Follow me here to http://www.cupcakeblog.com. Adding value to flour, eggs, and sugar since 1983. This is a Flickr badge showing photos in a set called cupcakes. Make your own badge here. I made these ricotta raspberry almond cupcakes for "ladies night". My aunt was having a bunch of overnight guests and I wanted to make an adult-tasting dessert that matched the Italianesque meal of roasted chicken. I also wanted the cupcakes to be fun, as I knew we wouldn't be digging into them until after many martinis. The cupcakes were what I hoped. Moist, sweet, and subtle almond flavor, balanced with the tartness of the raspberry. The ricotta gave it moistness and heartiness that I liked. The addition of the burnt butter almonds lended a crunchy texture, but I would say that they are definitely optional. The meringue frosting had a touch of citrus and was fairly sweet. At the end of it, many of us ended up with sticky pink frosting clinging to our faces. 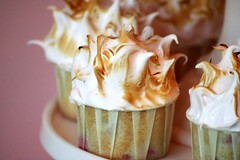 5. using a blow torch, brown the meringue. If I was feeling especially ambitious, which I wasn't because I was out all day and got home kind of late, I would have made homemade almond paste and homemade ricotta cheese. I would expect that substituting homemade ingredients would provide a more delicate outcome. Those cupcakes are so beautiful! I love your photography! Very beautiful site!! Cheers to you! I love almond tasting desserts... YUMMY! those photos came out nice. 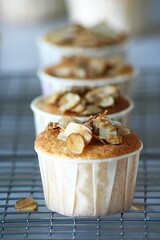 where ever did you get the great idea of making almond cupcakes? Your cup cakes look fantastic! 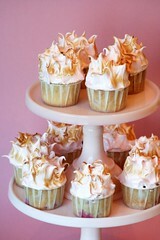 I also like the ice cream cone cup cakes from the post below...I'v got to try that :) You've got such a charming blog! Wow! Those look so festive. I can't stop reading your site, even thought I can't eat gluten or the photos. No matter--it's just fun to watch your passion on these pages. Hay PuppyChulo - actually, my husband was talking about some burnt butter almond thing his grandmother used to make. That was my initial inspiration, that and italian ricotta cake. Shauna - That is the irony of all this, isn't it... we can't share each others creations! I am always inspired by your blog however. And I guess that's the real point. Chockylit--Can't imagine how wonderful these must have tasted...almonds and ricotta and raspberries...oh my. Yes! Hi Chockylit - I fell in love with your beautiful cupcakes, such a wonderful site! Your pictures are really gorgeous too. I'm sure you've been asked this before, but where do you get those lovely paper moulds? I bet I can't get them here in the UK... Keep up the great work.